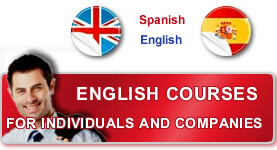 Our work is in charge of highly trained professionals, with a certified degree in Language Teaching. Our method aims at achieving a quick acquisition of the different idiomatic abilities through enjoyable lessons where the student is the star, role-playing real situations and working with authentic material in order to make the student feel at ease and interested in what he or she is doing, while sharing a cup of coffee. The main objective is to achieve an effective Communications in a short term. In order to do that, it is essential for the student to have a lesson where he can practise oral and listening skills. Written exercises are sent for homework so as to take advantage of the time they are in class to practise and role-play real situations. For those people who need the language as soon as possible we will design a course adapted to his or her needs and we will also provide individual lessons if that were necessary. We count on modern classrooms, good lighting, audiovisual material, comfortable chairs, and internet facilities. The environment is specially designed for developing our courses comfortably.